When it's hot or you just have a lot on your plate, this dessert lets you get the awesome praise in just the fraction of the time. 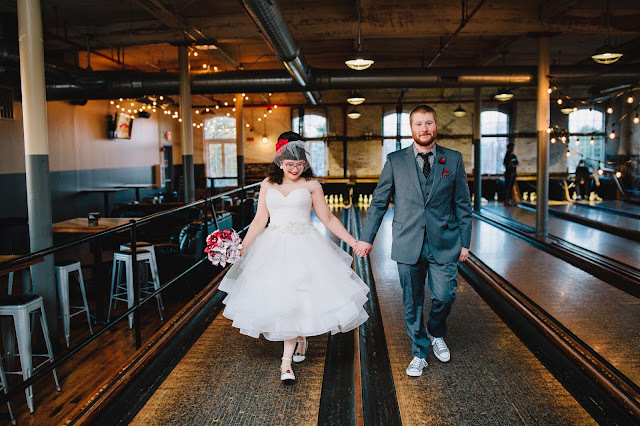 I decided it was time, though, to kick this old standard up a notch. 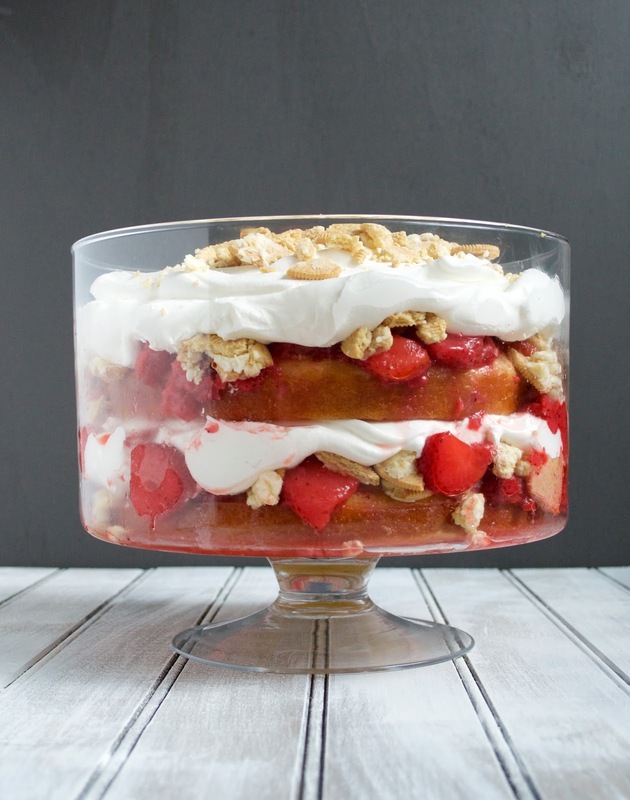 Sure, cake, strawberries, and cool whip are dang delicious but what if we added something else? What if we layered Golden Oreos between the strawberries and cool whip? I knew it'd be just the thing to upgrade this simple dessert. The Oreos absorb some of the strawberry's liquid but don't get overly soggy. 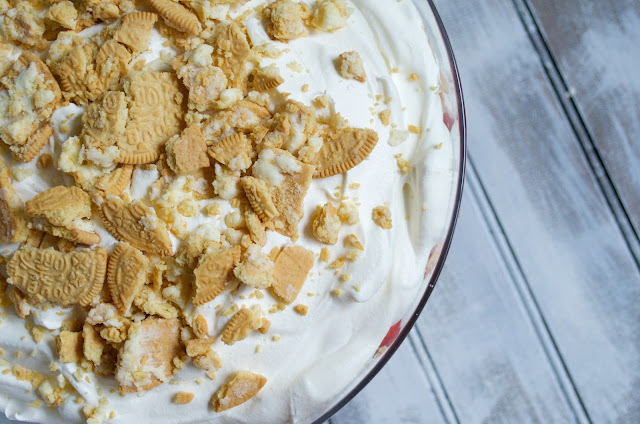 The bits that don't get much liquid action stay crunchy and add a new texture to the otherwise soft trifle. I know you'll be happy if you make this. I promise it won't take much brain power. The cake comes together so easily and you can bake it a couple different ways. You can simply make two round cakes or you can bake it up in a 9x13 pan and cut the cake up into squares. 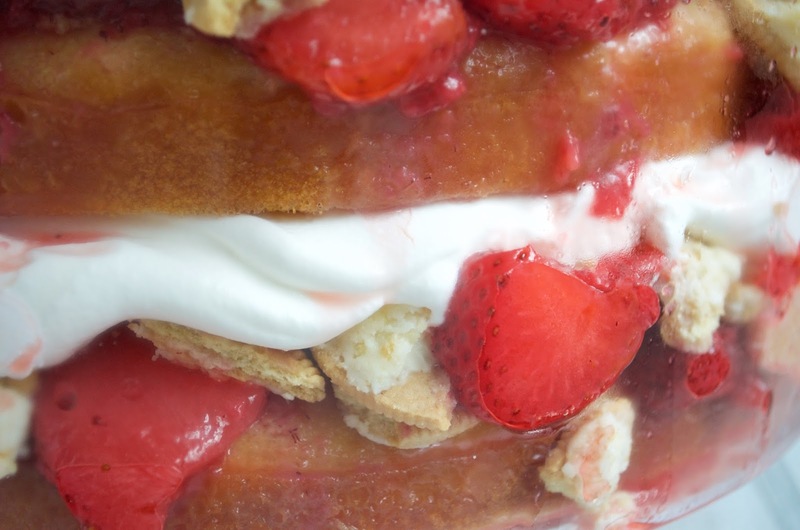 From there, you just layer it all up - cake, strawberries, cookies, cool whip, cake, strawberries, cookies, cool whip, cake - OK, you get the picture, right? Mmm, layers. Yummy, scrumptious layers! Prepare and bake cake as directed on box (you have 2 choices with the cake: you can make two 9 inch rounds if your bowl allows or you can make a 9x13 pan and cut the cake into squares). Crush entire package of Oreos coarsely (I opted to crush them in a Ziploc bag with a rolling pin - I didn't want to crush in my food processor and grind the crumbs too fine). Place one cake on bottom of bowl (or cover bottom of bowl with cake pieces). On top of the cake, spoon enough strawberries to cover. Cover the strawberries with 1/3 of your Oreo crumbs. Carefully spread 1 container of Cool Whip over the crumbs. Repeat once more - cake, strawberries, cookies, ending with the second container of Cool Whip. Garnish with any leftover Oreo crumbs. What a beautiful trifle! I love strawberry desserts and with golden oreos, this sounds perfect! Super easy (almost stupid easy) family recipes are ALWAYS the best! 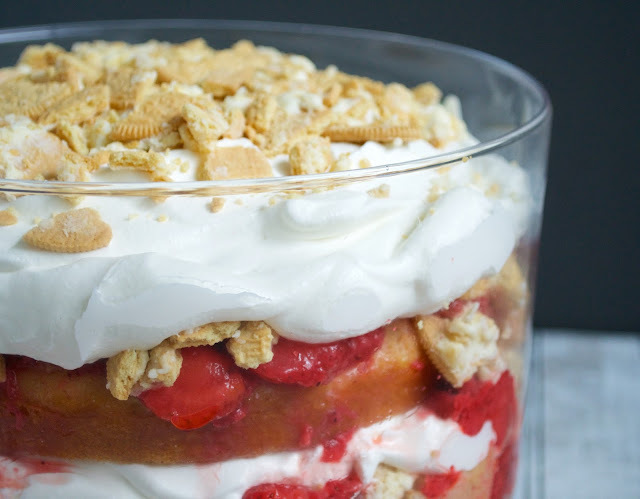 And this strawberry cream trifle looks delicious! I love that you kicked it up with crushed golden oreos!! I can imagine how scrumptious this is! Thanks for sharing! Cheers to a beautiful rest of the day! 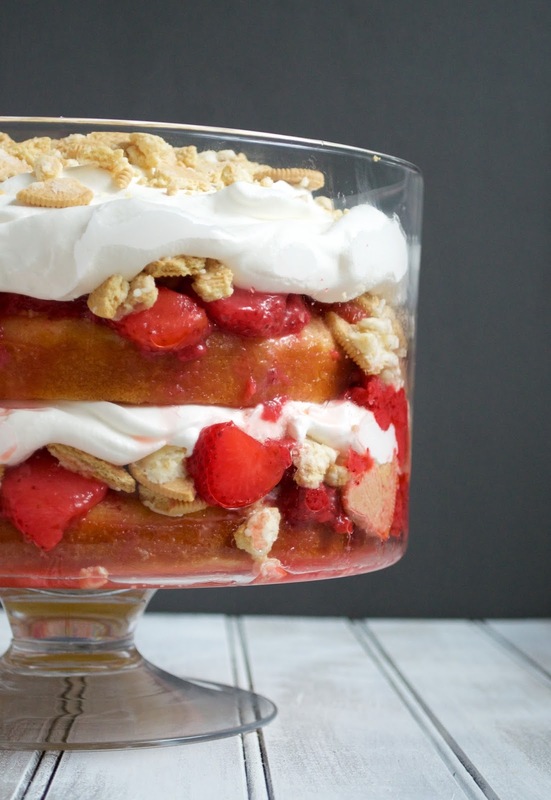 Are trifles really ridiculously easy? I have always wanted to try making a trifle (I am English for goodness sake!) but don't have one of those pretty trifle containers. Need to get one! This looks delicious! 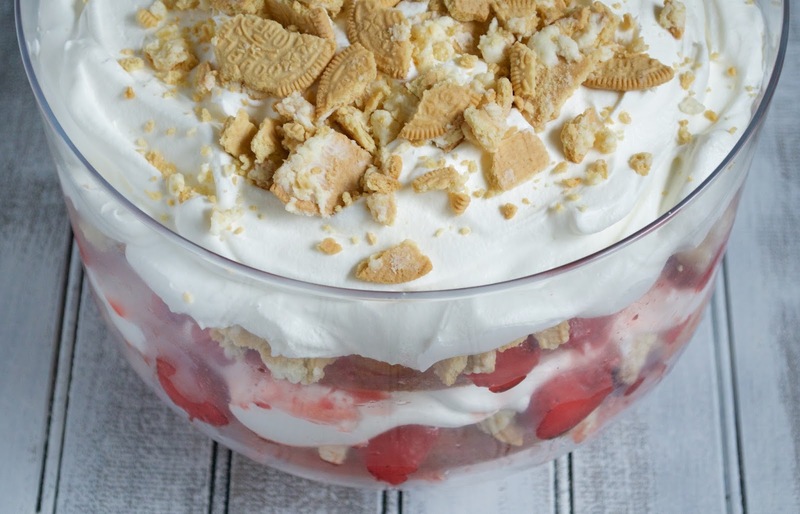 I couldn't agree more, trifles are such perfect desserts for entertaining. Yours looks absolutely divine- yum!